All of us work hard to create the content of our books, leaving the messy business of creating the .epub or .mobi files to someone else. However, every once in a while we need to create a draft of our ebook. You either need to get an idea of how the end product will look or to send to a beta-reader who doesn’t want a PDF. I’m going to tell you how to create a quick and simple ebook with Calibre. 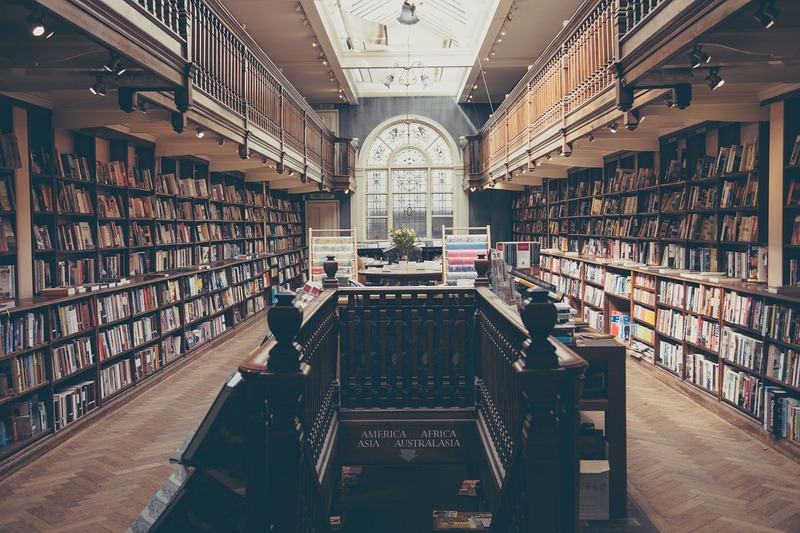 According its website, Calibre is “a free and open source e-book library management application developed by users of e-books for users of e-books”. I’ve used it for many years and it’s great. Now Let’s get to the meat of the matter. Follow these steps to turn a .doc file (or another document file) into a .epub or .mobi file. (Note: the following pictures contain LibreOffice instead of Microsoft Office because that is what I have installed on my laptop.) You can click any image to get a larger version. Change all your chapter headings to Heading 1. You can do this by selecting Heading 1 from the style menu. Click the “Add books” button. After the dialog box appears, you can browse to where your HTML file is located. Now click the “Convert books” button. From the top right of the new screen, you can select pub or mobi. There are quite a few options available, but your don’t need to use them all. Select the “Look & Feel” tab from the left side of the new dialog box. 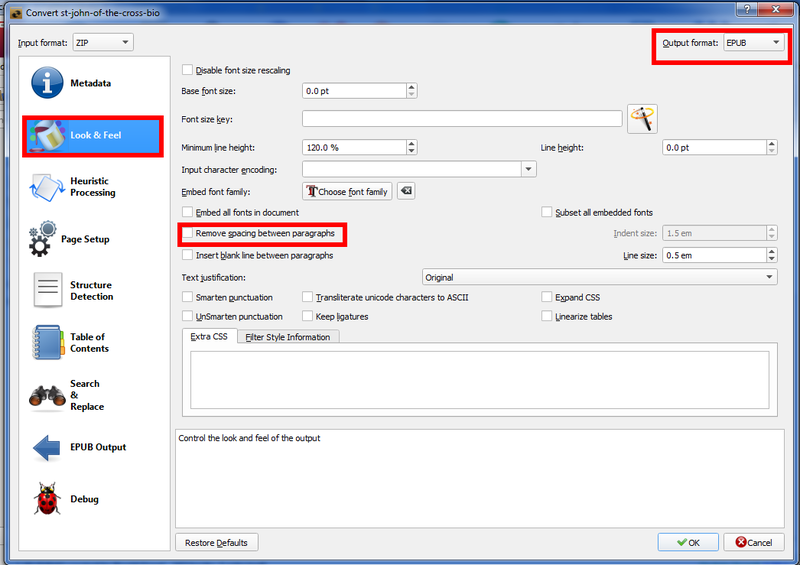 Now, select the “Remove spacing between paragraphs”. Next, select the wand icon to the right of “Level 1 TOC (XPath expression)”. 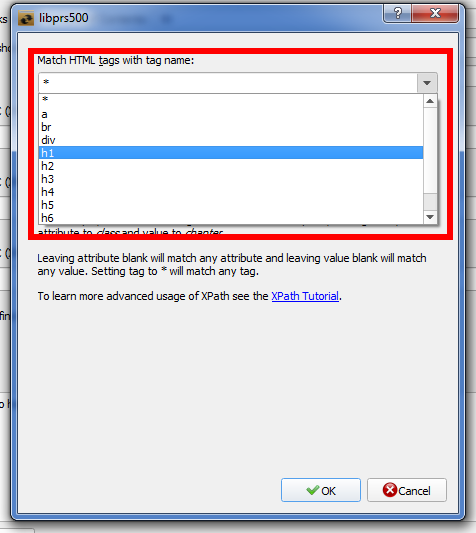 In the new window, select “h1” from the drop down menu under “Match HTML tags with tag name”. Click “OK” to close the window. Click “OK” again to convert the file. 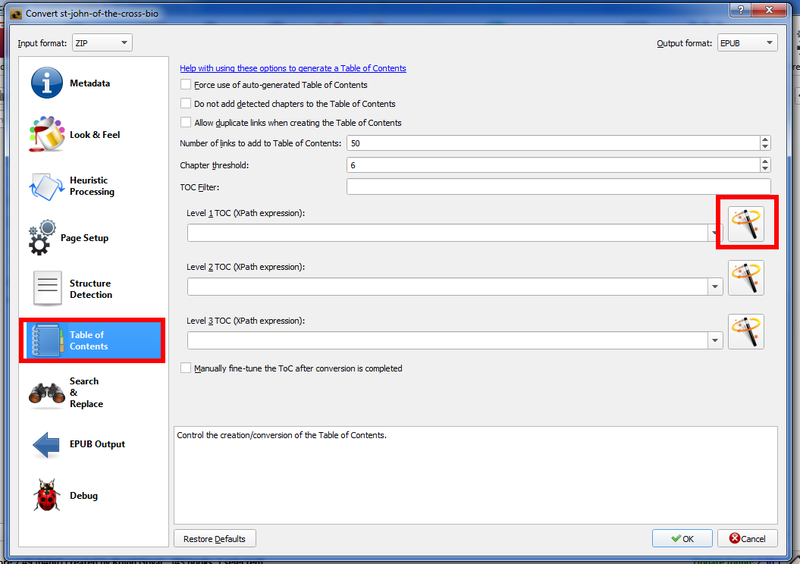 Once the conversion has finished, you can click the “Convert book” button again and select a different format. Well, that was fairly easy. I hope this tutorial helped you. John Paul Wohlscheid is the author of Church Triumphant: 25 Men and Women who Gave Their Lives to Christ, Don’t Look a Gift Horse in the Mouth and Trouble is My Client, and A Battle for the Faith (with Theresa Linden). He blogs at John Paul Wohlschied, Author. Today’s bookstore and library shelves are full of books, both fiction, and non-fiction, which are supposedly Catholic. Many of these books, are laced with the liberal, left-wing interpretation of Catholicism that became prevalent after Vatican II. This means that the people who read these books will be exposed to this version of Catholicism and since they don’t know any better, they will take it to be true. This is sad because there was a beauty, a majesty, and a simplicity that most people who have never experienced it will miss out. Back then, a spade was called a spade and a sin a sin. On the other hand, these books can also lead to misunderstandings among the Protestant community. How many conservative Protestants have gotten an erroneous view of Catholicism because they read a book by a New Age “Catholic”? If these people are exposed to the Truth, they will recognize it and be drawn to it. As a writer, I hope to bring back what has by in large been lost. My goal is to return religion to literature, Catholic religion in particular. I’ve already written several mysteries involving a priest named Fr. Benedict Granger, who was a private detective before he took up the cloth. I plan to write more and I plan to include references to the Latin Mass and traditional Catholic moral theology. I’m not saying any of this to pat myself on the back, but to show how Catholics can evangelize and reawaken interest in the Traditions of the Catholic Church through words. This is a call to all Catholic writers to pitch in and take back Only with much prayer and effort will we be able to win the world back for Our Lord. John Paul Wohlscheid is the author of Church Triumphant: 25 Men and Women who Gave Their Lives to Christ, Don’t Look a Gift Horse in the Mouth and Trouble is My Client, and the upcoming A Battle for the Faith (with Theresa Linden). He blogs at John Paul Wohlschied, Author. Today, my message will be very short and sweet. The tools that you use to write are not important. Yes, you heard me right. Let me explain. It seems like every writing website has an advertisement for some piece of software or tools to improve your writing, but in the long run you don’t need those tools. I’ve written stories using pen and paper, Google Drive, FocusWriter, Word, Pluma, Notepad++, yWriter, and haroopad. 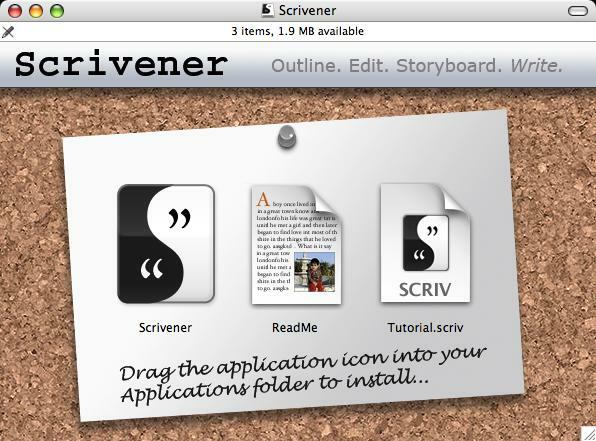 Each one of tools has its own features to “improve” your writing (FocusWriter offers distraction-free writing and yWriter is a free clone of Scrivener), but they also add a level of complexity. This added complexity takes you away from your story. It makes you jump through hoops to get any writing done. As William Faulkner said, “The tools I need for my work are paper, tobacco, food, and a little whiskey.” If we focus on creating masterpieces with words instead of trying to master a new program, we will be ahead of the game. In closing, here is a clip of George R. R. Martin talking about what he uses to write. John Paul Wohlscheid is the author of Church Triumphant: 25 Men and Women who Gave Their Lives to Christ, Don’t Look a Gift Horse in the Mouth and Trouble is My Client. His stories feature a hard-boiled detective in the tradition of old-time radio shows. He blogs at Writer’s Soapbox. I’m sure that everyone is familiar with Wikipedia. Everyone has visited Wikipedia at some time or another looking for some small piece of information, only to emerge hours later after reading through one wikipage after another. This is because the pages on Wikipedia are interconnected. For example, one minute I could be reading about the French Foreign Legion and a couple minutes later I could be reading about Abbot and Costello because they made a film about the FFL. Now imagine that instead of pages about pages about the comedy greats, World War II, and ISIS, Wikipedia had pages dedicated to the characters and places in your stories. It can happen. Recently, I was visiting a tech website and on this website there was a question about what software each writer used. One person recommended using a wiki for world building. I took this idea and tried it for myself. It worked great. I tested several personal wikis programs and the best one I found was TiddlyWiki. TiddlyWiki is free and will run on any operating system, whether you have Windows, Mac, or Linux. You don’t need any special software to run it. All you need is a browser, no extra software. It is very quick and everything is listed on one long page, which you can navigate with links. I used TiddlyWiki to create a wiki for my noir detective, Benny Cahill. You can see a screenshot above. It may look rough because it is. Right now, a short story is keeping me busy, but as soon as I am done, I will finish this wiki. Even in its rough state, you can see the direction it is headed. I will create a separate section or tiddly for each character, location, and story. It will take some time, but when I’m done it will be very easy to keep track of my character and the locations I use. It will also enable me to become just a little more organized. If you have Dropbox or another cloud backup system in place (like Copy or iCloud), you can make sure that your TiddlyWiki does not get lost if you computer crashes. Please let me know in the comments below if you have used a wiki for your stories or if this idea is helpful for you. P.S. I just made my new collection of saint biographies, Church Triumphant: 25 Men and Women who Gave Their Lives to Christ, available for preorder on Amazon, Barnes and Noble, and iTunes. If you buy it now, it will be available to read on Easter Sunday. Thanks. Besides Church Triumphant, John Paul Wohlscheid is the author of Don’t Look a Gift Horse in the Mouth and Trouble is My Client. Both feature a hard-boiled detective in the tradition of old-time radio shows. The author blogs at Writer’s Soapbox. Well, you finished the first draft of your story. Now what? One of the things I like to do is create a word cloud. A word cloud takes a group of words (such as those used in a story) and puts them in a huge pile. The size of each word depends on how many times it was used. For example, in the first word cloud below for John 1, the most used words are “thou”, “God”, “saith”, and “John”. In the second example, you can see that after the name of one of the main characters, the word I used most often was “like”. This second example show me two things: I used the word “like” more than a teenage girl and that I should use a different word when I compare things. Why do this? As I stated before, it can help you easily see if you are overusing a word. It can also give you an idea of which characters you put more importance on. Give it a try. It may give you a new perspective on your writing and your story. There are several different options when I comes to creating a word cloud. Just google that term and you’ll find several sites. However, my favorite site is Wordle. This gives you all kinds of options, such as what colors to use, the orientation of the words, and more. Unfortunately, if you want to save the word cloud to your computer you need to take a screenshot. John Paul Wohlscheid is the author of Don’t Look a Gift Horse in the Mouth and Trouble is My Client. Both feature a hard-boiled detective in the tradition of old-time radio shows. The author blogs at Writer’s Soapbox.